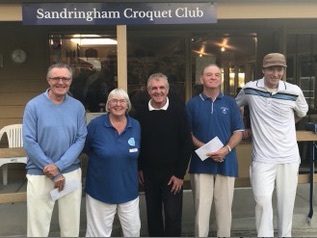 Twenty entries were received representing eight clubs - Bright, Brighton, Brunswick, Kew, MCC, Monash, Ringwood and Sandringham. Brian Foley, Mairi McIntosh and Mike Cohn performed refereeing duties. A strong field in Division 1 produced some exciting play with Greg Hill (Brunswick) and Kevin Maloney (Bright) being declared joint winners with 4 wins each and the same number of net hoops. Division 2 was won by Gavan Woinarski (MCC) with Tom Kudelka (MCC) finishing second. In Division 3 Greg Barnes (Brighton) showed great potential to win convincingly from Mike Cohn (Kew). Kate Patrick (Brunswick) won Division 4 from Philippa Johnstone (Sandringham). The courts were in very good condition and the catering by Sandringham members was appreciated.